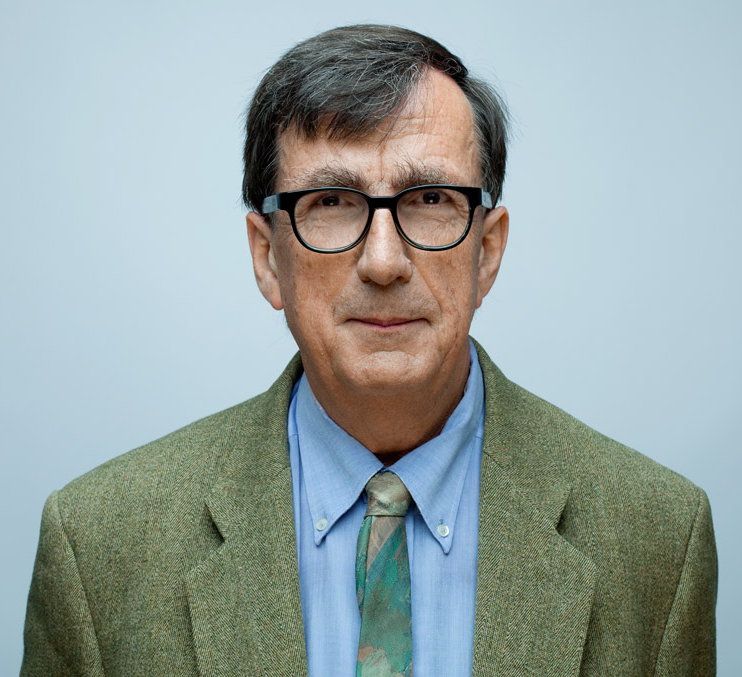 Anthroplogist and sociologist Bruno Latour will visit Columbia University September 22-25. During his visit, he will give a public lecture (with Q&A by Nicholas Lemann of the Columbia School of Journalism), participate in both student and faculty seminars, and oversee three presentations of his play "Gaia Global Circus" at The Kitchen in Chelsea. The David and Helen Gurley Brown Institute for Media Innovation at Columbia’s Graduate School of Journalism has organized and sponsored Prof. Latour's visit with assistance from Alliance (Columbia, École Polytechnique, Sciences Po, and Panthéon-Sorbonne University), the Faculty of Arts and Sciences, The Department of Sociology at Columbia, The Interdisciplinary Center for Innovative Theory and Emprirics (INCITE, the faculty seminar with Prof. Latour being part of the Paul F. Lazarsfeld Lecture Series), The Department of Middle Eastern, South Asian, and African Studies (MESAAS), Columbia Maison Française, and The Center for Science and Society. 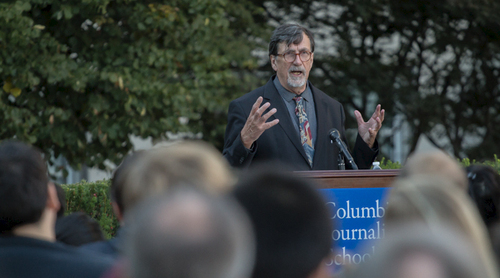 Monday night, Prof. Latour spoke to an audience of 500 people on his recent work is on climate change, on global ecological crisis. You can see a video of the event here. 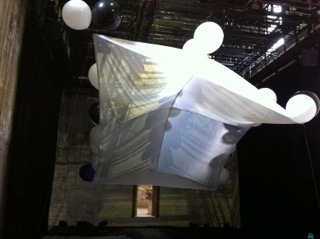 Next up, his project "Gaia Global Circus" will be presented at The Kitchen in Chelsea. To help understand the disconnect between the scale of the problems we are facing and the set of "emotions, habits of thought and feelings" we need to respond to such crises, Prof. Latour has left traditional publishing and has created theatrical experiences. 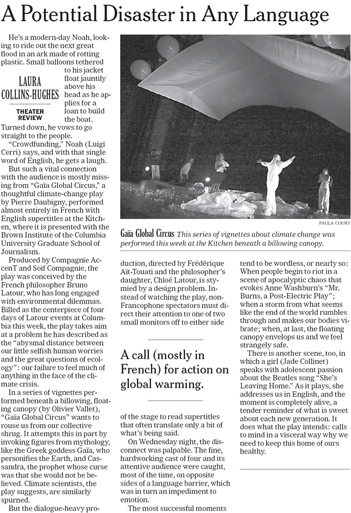 "Gaia Global Circus" explores how the language of theater might help us appreciate our situation in ways that the language of science alone has not. Prof. Latour is a unique breed of academic and "Gaia Global Circus" is just one example. When creating his magnum opus, "An Inquiry into Modes of Existence" (AIME), summarizing 25 years of his work, he not only produced a printed book, but also designed a web platform that allows readers and co-authors to make additions and modify the text. It is a daring experiment in collective, digital scholarship. Over the last decade, Prof. Latour has overseen theatrical projects, staged reenactments (a 1903 debate between Tarde and Durkheim), and art exhibitions ("Making things public" and "Iconoclash"), forging a new kind of "creative research." These projects are not simply publicly accessible presentations of more complicated research, but instead constitute new modes of research in their own right. 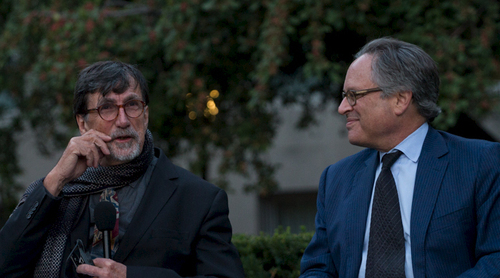 This is why the Brown Institute was eager to host Prof. Latour this week. And we're off to a great start! On Tuesday afternoon in the Brown Institute space, Prof. Latour met with 25 graduate and post-graduate students from an assortment of Schools within the University. 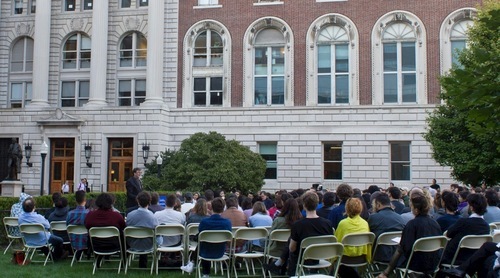 Ranging from journalism to anthropology, partical physics to architecture, both the sciences and the humanities had ample student representation. Over a few hours, Prof. Latour provided critique and response to questions posed by students using his research on actor-network theory, amoderism, Gaia and the Anthropocene and more. In the evening, Compagnie AccenT and Soif Compagnie presented--in dress rehearsal format--Gaia Global Circus, followed by a Q&A with the troupe and Prof. Latour. 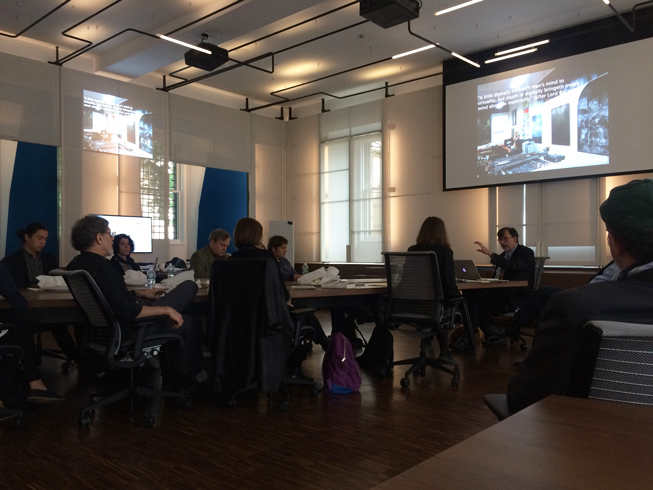 On Wednesday afternoon in the Brown Institute space, Prof. Latour met with 30 faculty from an assortment of Schools within the University, as well as visiting faculty from the University of Virginia, Washington University and City College. Prof. Latour explained his methodology and responded to questions pertaining to An Inquiry into Modes of Existence, and its accompanying web platform. In the evening, Compagnie AccenT and Soif Compagnie gave the first of two presentations ofGaia Global Circus, followed by a Q&A with the troupe and Prof. Latour. On Thursday evening at The Kitchen, Compagnie AccenT and Soif Compagnie gave the final presentations ofGaia Global Circus, followed by a Q&A with the troupe and Prof. Latour. While politics has always been linked to geography, the Earth itself has largely been seen as playing a backstage role, the mere window-dressing for human intention and interest. Bruno Latour notes that with the advent of the epoch known as the 'Anthropocene,' the Earth is no longer in the background, but very much in the foreground, in constant rivalry with human intentionality. The term Anthropocene was coined to describe a new geological epoch, one in which the human being, the Anthropos, is not simply a biological agent, but instead a geological force, capable, for example, of quickening the pace of global climate variations. Latour confronts head on the figure of Gaia, that is, the Earth understood not as a biogeophysical system, but as a full-fledged actor, an agent of history--or rather “geostory." Gaia is not Nature, nor is it a diety. It is a new form of political power, an intruder, a gate-crasher, demanding our attention. For Latour, geopolitics is not about human politics overlaid on the static frame of the Earth, but politics about contradictory portions, visions, aspects of the Earth and its contending humans. Such is the new situation for which we don’t seem to be well equipped intellectually. The French philosopher, anthropologist, and sociologist Bruno Latour presents a theatrical experiment inspired by a paradox: Although we are confronted with global warming and the prospect of mankind’s end, we feel almost nothing. Gaia Global Circus takes place in the gap between the significance of such stakes and the limited repertoire of concepts and feelings with which we attempt to approach them today. Gaia Global Circus will be presented September 23 for Columbia students, faculty and staff on September 24 and 25 for the general public at 8 pm at The Kitchen 512 W 19th Street, NYC. On Wednesday, September 24, 12-2 pm, the Brown Institute for Media Innovation is hosting a faculty colloquium to discuss with Professor Latour his latest book, An Inquiry Into Modes of Existence: An Anthropology of the Moderns (Harvard 2013). The printed book is part of a larger digital platform, AIME, through which the book has been augmented and modified by interested readers and co-authors. As an introduction to the discussion, Latour will report on the results of this two-year experiment in collective digital scholarship. Participants should plan to explore in advance both the book and the expanded digital discussion at www.modesofexistence.org (simple registration required). While the book is also available as a 500-page printed text, the digital version includes the notes, glossaries, and extended discussions that offer a more readable introduction to the project. An Inquiry Into Modes of Existence offers positive answers to the question raised only in negative form in Latour's celebrated 1991 book, We Have Never Been Modern. The latter book is a useful introduction to Latour's work.